I pulled these out again. I really like these blocks and have been thinking about making more. I used a jelly roll to make these and I’m down to scraps. I did find a FQ from this line recently and that along with a piece of French General red I brought with me, was enough to squeak out the cuttings for 5 more blocks. Of course, I would really like 5 more blocks and a border. Hmmmm…… That would require some shopping since I don’t have my stash here. I think I’ll go sew up these five blocks while I think about that. This is going to be a beautiful quilt! 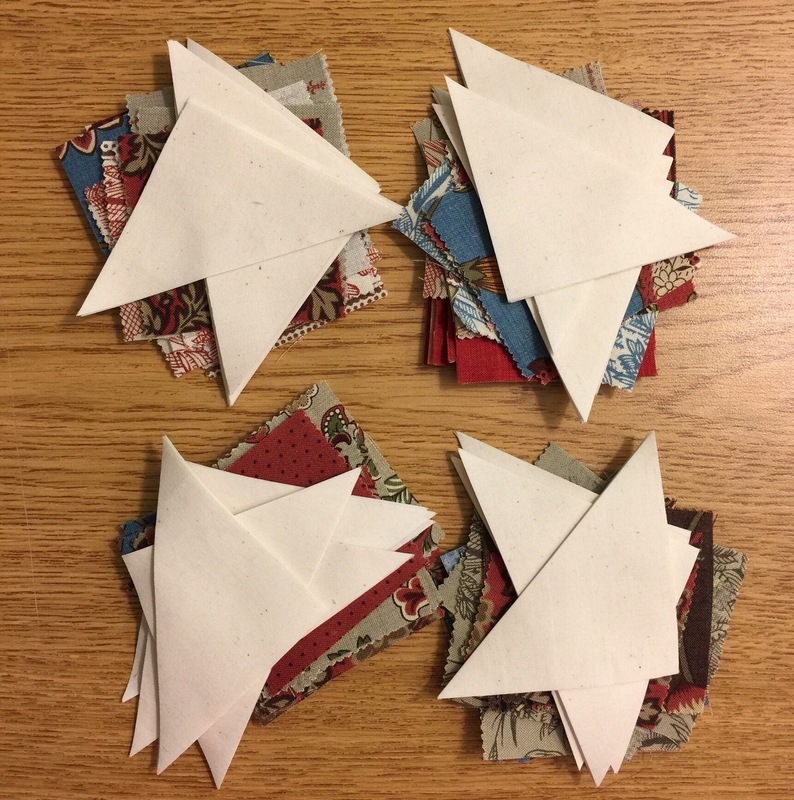 A friend and I got together to make blocks like these from our Christmas fabrics. 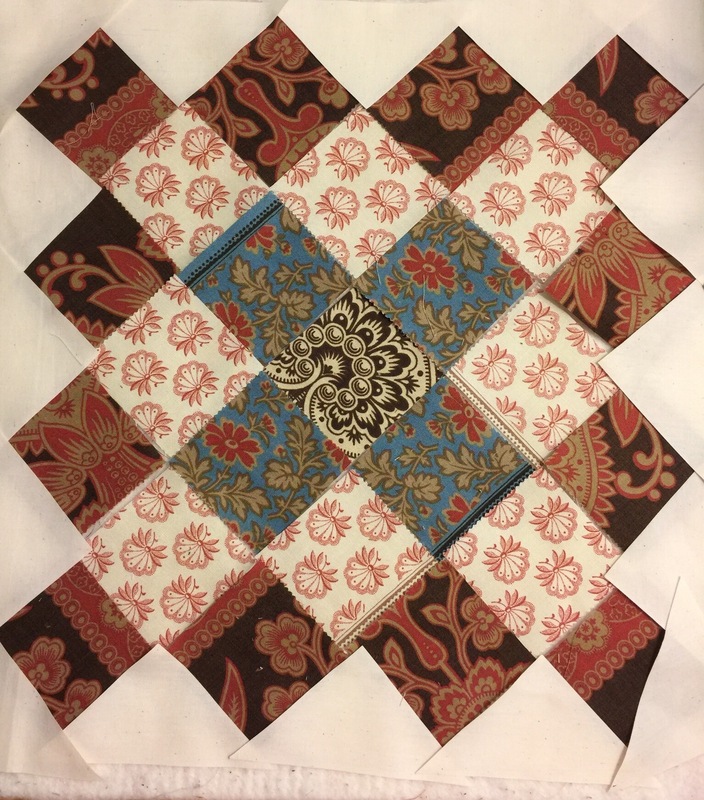 She had already made one blocks and used 2.5″ cream squares for the outer round and decided the next blocks needed 2.5″ x 3″ rectangles instead to make squaring up the block easier. I notice that you have triangles cut. What size are they? Did you die cut them? If so, do you mind sharing the die information? What size is your block? Thanks! 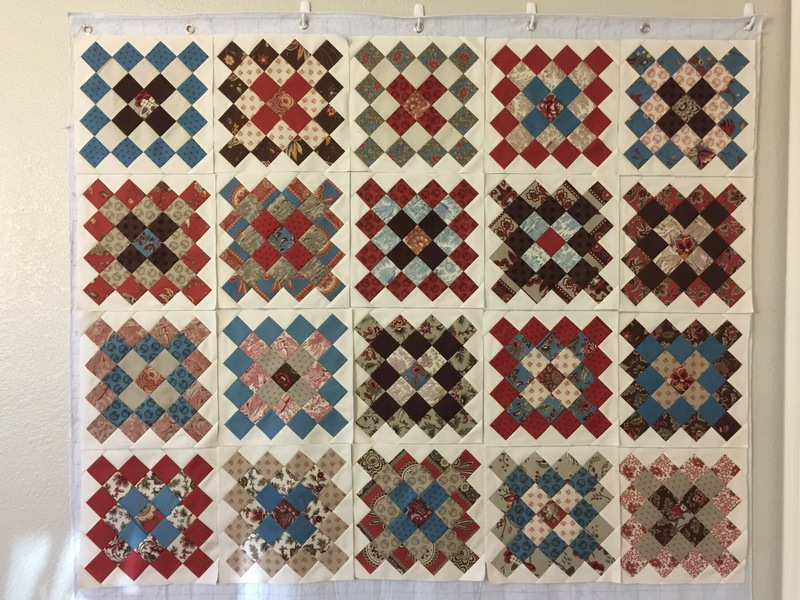 I’ve always loved this block, and your fabrics are spectacular! Please tell me what you’re using for your design wall – a shower curtain? With those grommets, that’s what I thought of first. It looks like you’ve used Command Strips to hang it? Lovely. Hey, you can come look thru my stash on Thursday for something that might work! This is a great fabric line! Blocks look very nice! I love your color arrangement within the blocks. The resulting look is so classic. This will be a beautiful quilt!